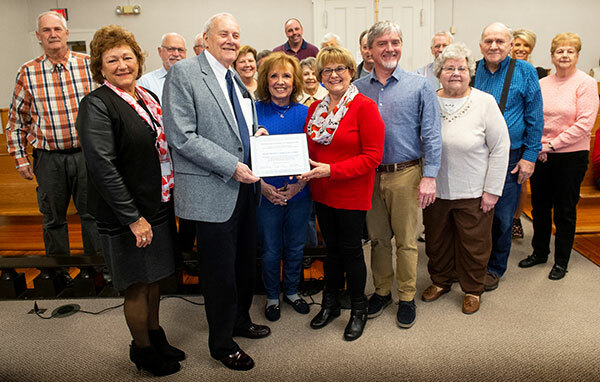 The Monroe County Board presented at its Monday meeting a certificate recognizing Zoar United Church of Christ in New Hanover for 175 years of service. Pictured, from left, are commissioner Ron Schultheis, commissioner Vicki Koerber, Alan Brandt, Glenn Woodcock (partially hidden), commissioner Bob Elmore, Leslie Patterson, Twyla Woodcock (partially hidden), Carol Kettler receiving the certificate, Bobbie Bane, Nancy Prather also receiving the certificate, Ruthann Mitchell (behind Prather), Buddy Kettler, Zoar Pastor RJ Morgan, Tom Nickel, Rosalie Reis, Marvin Reis, Tammy Mitchell Hines and Luann Roy. The semi-monthly public meetings of the Monroe County Board of Commissioners were on the move Monday. The Feb. 4 meeting began at its new time of 8:15 a.m., 15 minutes later than its original start time, and in a historic new location — the old courtroom. This room sits on the western side of the courthouse, in the portion that was completed in 1851. It has since been replaced by two newer courtrooms on the eastern end of the building, but has been maintained and used for ceremonies, community meetings and as an overflow site.